a graffiti phonecam bangkok live shot, originally uploaded by electra-cute. Hi everyone!!! Wow what a day we had in the fabulous city of Bangkok…we started the morning with a traditional breakfast of Egg Mc Muffin and Starbucks!! Wooo Hoo!!! oK..WE ADMIT THAT IT WAS A CHEESY THING TO DO BUT WE WERE HUNGRY AND WANTED TO GET TO THE WHOLESALE MARKET. Enroute to the market we got sidetracked a number of times by everything from boats to beggars and took photos of it all!!! The photo you see here was taken in a smaller indoor mall that we stepped into to catch a bit of air conditioning. There was an awesome Chinese New Year display that we couldn’t resist using as a prop for our GRAFFITI PHONE CAM moment of the day! You can barely see me behind the display but I’m there!! We also got our 2 1/2 hour massages and facials at the hotel spa and WOWWWWWW we barely were able to crawl back to our rooms. What a workout and then on to dinner with our Chow friend Ek who lives in Bangkok…see next posts…. What a great display. Thanks for snaping it to share. hey billie!! Thanks for stopping in!!! 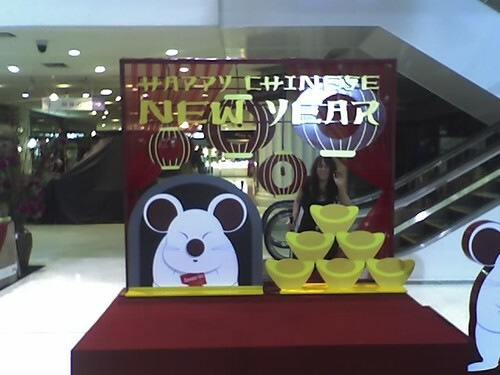 That mall was a cute one with all sorts of gemstone strands for sale for Chinese New Year. I saw a number of nice foo dogs too!!!! Sounds like you two are having a ton of fun. Can’t wait to see all of the goodies you come home with. Did someone say gemstone strands??? Sorry, Paula had to help me get on this site. Iwas waiting for another e-mail Will continue to look at now that im on. I’m so sorry about John—I know Jill will be glad to be home, but be careful putting her back with the boys too fast. They may object. We had already heard about Wyatt and the Best Puppy—-are we PROUD or what!!! SOUNDS LIKE YOU ARE HAVING A GREAT TIME TRIP OF A LIFE TIME——-LOTS OF BEADS TO BRING BACK???????? ?